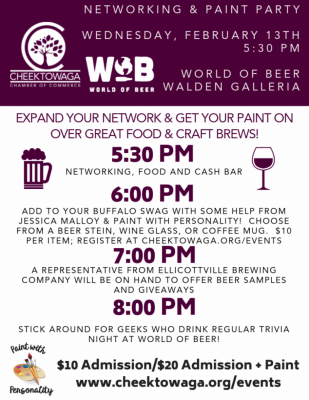 Join the Cheektowaga Chamber of Commerce for their Networking and Paint Party event at World of Beer on Wednesday, February 13th at 5:30 pm! Starting at 5:30, network and hang out at the food and cash bar! At 6:00, paint a beer stein, wine glass, or coffee mug with Jessica Malloy & Paint With Personality for just $10! At 7:00, enjoy samples and giveaways from Ellicottville Brewing Company! At 8:00, stick around for Geeks Who Drink trivia night at World of Beer. Admission is $10 to get in and $20 for admission +paint. See Cheektowaga Chamber of Commerce or World of Beer for more information.